The incandescent light bulb (archaically known as the electric lamp) uses a glowing wire filament heated to white-hot by electrical resistance, to generate light (a process known as thermal radiation or incandescence). The bulb is the glass enclosure which keeps the filament in a vacuum or low-pressure noble gas, or a halogen gas in the case of quartz-halogen lamps (see below) in order to prevent oxidisation of the filament at high temperatures. In Australia a light bulb is also called a light globe, but this term is not used elsewhere. Because of its poor efficiency and yellowish color, it is being gradually replaced in many applications by fluorescent lights, high-intensity discharge lamps, LEDs, and other devices. The invention of the light bulb is sometimes attributed to Thomas Alva Edison, who made contributions to its development producing a practical and viable electric lamp and succeeded in marketing the device, but today it is well-known that Heinrich Göbel built functional bulbs three decades earlier. Many others also contributed to the development of a truly practical device for the production of electrically generated lighting. In 1820 a British scientist Warren De la Rue enclosed a platinum coil in an evacuated tube and passed an electric current through it. The design was based on the concept that the high melting point of platinum would allow it to operate at high temperatures and that the evacuated chamber would contain less gas molecules to react with the platinum, improving its longevity. Although it was an efficient design, the cost of the platinum made it impractical for commercial use. In 1835 James Bowman Lindsay demonstrated a constant electric light at a public meeting in Dundee. He stated that he could "read a book at a distance of one and a half feet". However having perfected the device, to his own satisfaction, he turned to the problem of wireless telegraphy and did not develop the electric light any further. In 1854, the German inventor Heinrich Göbel developed the first 'modern' light bulb: a carbonised bamboo filament, in a vacuum bottle to prevent oxidation. In the following five years he developed what many call the first practical light bulb. His lamps lasted for up to 400 hours. He did not immediately apply for a patent, but his priority was established in 1893. Joseph Wilson Swan (1828-1914) was a physicist and chemist born in Sunderland, England. In 1850 he began working with carbonised paper filaments in an evacuated glass bulb. By 1860 he was able to demonstrate a working device but lack of a good vacuum and an adequate supply of electricity resulted in a short lifetime for the bulb and inefficient light. By the mid-1870s better pumps became available, and Swan returned to his experiments. Swan received a British patent for his device in 1878. Swan reported success to the Newcastle Chemical Society and at a lecture in Newcastle in February 1879 he demonstrated a working lamp that utilised a carbon fibre filament. The most significant feature of Swan's lamp was that there was little residual oxygen in the vacuum tube to ignite the filament, thus allowing the filament to glow almost white-hot without catching fire. From this year he began installing light bulbs in homes and landmarks in England and by the early 1880s had started his own company. Across the Atlantic, parallel developments were also taking place. On July 24, 1874 a Canadian patent was filed for the Woodward and Evan's Light by a Toronto medical electrician named Henry Woodward and a colleague Mathew Evans, who was described in the patent as a "Gentleman" but in reality a hotel keeper. They built their lamp with a shaped rod of carbon held between electrodes in a glass globe filled with nitrogen. Woodward and Evans found it impossible to raise financial support for the development of their invention and in 1875 Woodward sold a share of their Canadian patent to Thomas Edison. Edison purchased the Woodward and Evans patent and had a team of developers search for an alternative filament material. Eventually he used a carbon filament that burned for forty hours (first successful test was on October 21, 1879; it lasted 13.5 hours). Edison continued to improve their design. The original spiral carbon-filament is shown and repeatedly referred to in his initial light patent. By 1880 he had a device that could last for over 1200 hours using a bamboo-derived filament, longer than the 400 hours of Heinrich Göbel's earlier light bulb. In January 1882, Lewis Latimer received a patent for the "Process of Manufacturing Carbons," an improved method for the production of light bulb filaments which yielded longer lasting bulbs than Edison's technique. In Britain, Swan took Edison to court for patent infringement. Edison lost and as part of the settlement, Edison was forced to take Swan in as a partner in his British electric works. The company was called the Edison and Swan United Electric Company. Eventually, Edison acquired all of Swan's interest in the company. Swan sold his United States patent rights to the Brush Electric Company in June 1882. The United States Patent Office had ruled on October 8, 1883 that Edison's patents were based on the prior art of William Sawyer and were invalid. Litigation continued for a number of years. Eventually on October 6, 1889, a judge ruled that Edison's electric light improvement claim for "a filament of carbon of high resistance" was valid. Research exposed in "A Streak of Luck" by Robert Conot (1979), shows that Edison and his attorneys hid significant information from the judge. They cut out the October 7-21, 1879 section of a notebook that the judge might have determined showed that they were simply extending Sawyer's (or Swan's) work with carbon "burners" or "rods" in an evacuated glass bulb. Edison and his team did not find a commercially workable filament (bamboo) until more than 6 months after Edison filed the patent application. The weak and short lived (40 to 150 hours) carbon filament was eventually superseded by the tungsten filament. In 1903 Willis Whitnew invented a filament that would not blacken the inside of a light bulb. It was a metal-coated carbon filament. In 1906, the General Electric Company was the first to patent a method of making tungsten filaments for use in incandescent lightbulbs. The filaments were costly, but by 1910 William David Coolidge (1873-1975) had invented an improved method of making tungsten filaments. The tungsten filament outlasted all other types of filaments and Coolidge made the costs practical. One of the major problems of the standard electric light bulb is evaporation of the filament. The inevitable variations in resistivity along the filament cause nonuniform heating, with ‘hot spots’ forming at higher resistivity. Thinning by evaporation increases resistivity. But hot spots evaporate faster, increasing their resistivity faster—a positive feedback which ends in the familiar tiny gap in an otherwise healthy-looking filament. Irving Langmuir suggested that an inert gas, instead of vacuum, would retard evaporation and still avoid combustion, and so ordinary incandescent light bulbs are now filled with nitrogen, argon, or krypton. A typical filament light bulb lasts about 1000 hours. See the section below, Voltage, light output, and life, for a discussion of the tradeoffs involved in setting a lamp life specification. 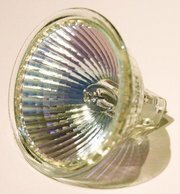 Halogen light bulb capsule (center) with an integrated dichroic reflector. This integrated design is referred to as an "MR16" package (Miniature Reflector, 16 eighths of an inch in diameter). A permanently-integrated UV filter is frequently included. The problem of short bulb life is addressed in the halogen lamp which is filled with a halogen gas such as iodine or bromine. This creates an equilibrium reaction where evaporated filament is chemically re-deposited at the hot-spots, preventing the early failure of the lamp. This allows halogen lamps to be run at higher temperatures which would cause unacceptable low lamp lifetimes in ordinary light bulbs, allowing for greater brightness and efficiency. Because the lamp envelope must be very hot for this to work, the envelopes are made of quartz glass instead of ordinary glass, which would soften and flow too much at these temperatures. Thus halogen lamps are sometimes called tungsten halogen lamps and are sometimes called quartz halogen lamps. They were once called quartz iodine lamps. Perhaps the most significant side effect of using quartz instead of ordinary glass is that the lamp becomes a source of UV-B light, because the quartz is transparent to this spectral range and ordinary glass is not. One consequence is that it is possible to get a sunburn from excess exposure to the light of a quartz halogen lamp. Quartz halogen lamps are used in some scientific instruments as UV-B light sources. Because the quartz is hot, and poses a danger of fire or burns, and because of the risk from UV exposure, these lamps are usually protected by a filter of ordinary glass, which, as noted above, absorbs most of the UV-B light. The quartz glass can be damaged by residue from fingerprints. These bulbs should be handled without touching the quartz capsule (the actual light bulb). If the quartz capsule is touched, it must be cleaned with rubbing alcohol. The incandescent light bulb is still widely used in domestic applications, and is the basis of most portable lighting (for instance, some car headlamps and electric torches). Halogen lights have become more common in auto headlights and domestic situations, particularly where light is to be concentrated on a particular point. The fluorescent light, has, however, replaced many applications of the light bulb with its superior life and energy efficiency. LED lights are beginning to see increased home and auto use, replacing incandescent bulbs. Newer headlights are going to high-intensity discharge lighting, such as halogen metal oxide, which look purplish instead of yellowish. In each designation, the E stands for Edison, who created the screw-base lamp, and the number is in millimetres. (This is true even in the United States, where other designations involving the diameter of the bulb itself are still given in eighths of an inch.) In North America, there are four standard sizes of screw-in sockets used for line-voltage lamps: candelabra (E12), intermediate (E17), medium or standard (E26), and mogul (E39). In continental Europe, these are instead slightly different: candelabra (E10 or E11), intermediate (E14), medium or standard (E27), and mogul (E40). There is also a rare "admedium" size (E29), and a very miniature size (E5), generally used only for low voltage applications such as with a battery. Bayonet bulbs have similar sizes, and are given a B designation. Halogen bulbs often come inside one of these standard bulbs, but also come with pin bases. These are given a G designation, with the number being the centre-to-centre distance in millimetres. Luminous efficiency is defined as the ratio of luminous flux to total radiated flux, and is measured in lumen per watt (lm/W) or as a percentage of 683 lm/W, the efficiency of a monochromatic source of wavelength 555 nm (a yellow-green colour to which the human eye is most sensitive). A different measure, the overall luminous efficiency, is defined as the ratio of luminous flux to total energy input. This is less than or equal to the luminous efficiency. Filament light bulbs are usually marketed according to the electrical power consumed. This is measured in watts and depends mainly on the resistance of the filament, which in turn depends mainly on the filament's length, thickness and material. It is difficult for the average consumer to predict the light output of a bulb given the power consumed but it can be safely assumed, for two bulbs of the same type, that the higher power bulb is brighter. Actual light output ratings are given in lumens, however most buyers do not check for this. Some manufacturers engage in deceptive advertising, such that the claimed "long" bulb life is achievable at normal household voltages, but the light output is only attainable at a higher voltage which does not normally exist, such as 130 volts in the United States. The 34, 52, 67, 90 and 135 watt bulbs are designed for use at 130 volts. Most incandescent lamps waste about 90% of the power they consume in heat. A fluorescent lamp, which is approximately four times more efficient (about 40%) than an incandescent lamp (about 10%), will produce one-sixth of the heat, assuming the same levels of light from both sources. This is one reason why fluorescent lighting is so popular in commercial spaces, as it also reduces the need for air conditioning in the summer. 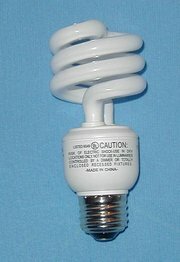 Self-ballasted Compact fluorescent light bulbs screw directly in to standard sockets, allowing a 26 watt bulb to replace a 100 watt incandescent, while still giving about 11 watts as light, and only about 15 (versus 90) as heat. Quality halogen incandescents are closer to 15% efficiency, which, although still extremely low, will allow a 60 watt bulb to provide nearly as much light as (and a 75 watt to provide even more than) a non-halogen 100 watt. However, small halogen lamps are often still high power, causing them to get extremely hot. This is both because the heat is more concentrated on the smaller bulb surface, and because the surface is closer to the filament. This high temperature is essential to their long life (see the section on Halogen lamps above). Left unprotected, these can cause fires much more easily than a regular incandescent, which may only scorch things like drapery. Most safety codes now require these bulbs to be protected by a grid or grille, or by the glass and metal housing of the fixture. 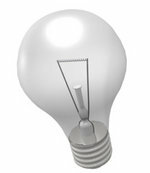 Bulbs over 300 watts are usually banned from indoor use. This means that 5% reduction in operating voltage will double the life of the bulb, at the expense of reducing its light output by 20%. This may be a very acceptable tradeoff for a light bulb that is a difficult-to-access location (for example, traffic lights or fixtures hung from high ceilings). So-called "long-life" bulbs are simply bulbs in which this tradeoff is designed in. According to the relationships above (which are probably not accurate for such extreme departures from nominal ratings), operating a 100 watt, 1000 hour, 1700 lumen bulb at half voltage would extend its life to about 65,000,000 hours or over 7000 years – while reducing light output to 160 lumens, about the equivalent of a normal 15 watt bulb. The Guinness Book of World Records states that a firehouse in Livermore, California has a light bulb that is said to have been burning continuously for over a century since 1901 (presumably apart from power outages). However, the bulb is powered by only 4 watts. A similar story can be told of a 40 watt bulb in Texas which has been illuminated since September 21, 1908. It once resided in an opera house where notable celebrities stopped to take in its glow, but is now in an area museum. In photoflood bulbs used for photographic lighting, the tradeoff is made in the other direction. Compared to general service bulbs, for the same power, these bulbs produce far more light, and (more importantly) light at a higher colour temperature, at the expense of greatly reduced life (which may be as short as 2 hours for a type P1 lamp). The upper limit to the temperature at which metal incandescent bulbs can operate is the melting point of the metal. Tungsten is the metal with the highest melting point. A 50 hour life projection bulb, for instance, is designed to operate only 50 °C (90 °F) below that melting point. Lamps also vary in the number of support wires used for the tungsten filament. Each additional support wire makes the filament mechanically stronger, but removes heat from the filament, creating another tradeoff between efficiency and long life. Many modern 120 volt lamps use no additional support wires, but lamps designed for "rough service" often have several support wires and lamps designed for "vibration service" may have as many as five. Lamps designed for low voltages (for example, 12 volts) generally have filaments made of much heavier wire and do not require any additional support wires. Kruger, Anton, "When Can LEDs Replace Incandescent Lamps (http://www.chipcenter.com/eexpert/akruger/akruger044.html)"?